Chevy SS to Base Below $30k? Chevrolet's new V8 muscle sedan could be the performance bargain we've been hoping for. 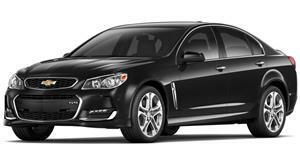 Chevrolet has yet to release official pricing for its recently unveiled SS sedan. The latest version of the Commodore-based rear-drive, V8-powered car that was formerly known to US buyers as the Pontiac G8 certainly won’t cost as much as most of its German competitors. However, a new report is suggesting that it’ll be more affordable than you’d think. Automotive News is claiming that the 2014 Chevrolet SS will carry a base price of just $27,535, considerably less than what was earlier predicted. Previous reports stated that the SS would likely cost closer to $45,000 but even that seemed somewhat high. A more realistic price would be around $35,000 to $40,000. GM Authority is questioning AN’s base-price claim, but even if the SS were to be priced over $30k, it’d still be around $10k lower than its Holden counterpart. The old G8 also had a cheaper sticker price than the Commodore by roughly the same amount. Our guess is that even when it's fully loaded with all the options, the SS should come in under $40k - still a bargain when compared to other full-size V8 sedans out there.